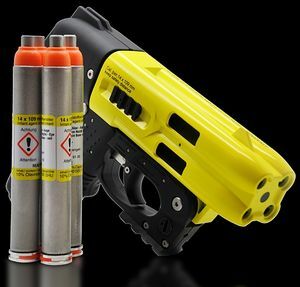 The JPX4 Shot Defender is a brand new product offered to Law Enforcement by Piexon AG. Now it's available to citizens for their own safety and self defense! 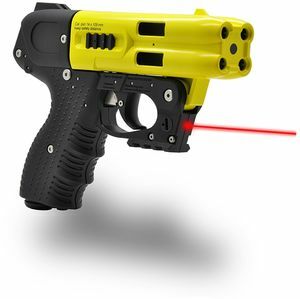 This is the only item that can fire 4 separate shots of pepper spray at 590 FPS from the nozzle approximately 23 feet. Most Less-lethal gadgets are restricted in range and dependability. The JPX 4 fires using real primers making it a really dependable weapon. It has been certified by ATF as a non-firearm without any registration needed. Each removeable cartridge fires incredibly powerful liquid 10 % OC at 590 FPS from the nozzle with a reliable range of 23 feet. With ease of training and the power of each super-strong pepper payload has made the JPX4 incredibly popular amongst police and corrections specialists globally. The JPX 4 brings four self-cleaning pepper rounds, making numerous shots readily available when needed. Refilling is fast and easy. You can pack each round separately so that you constantly have 4 rounds if needed.